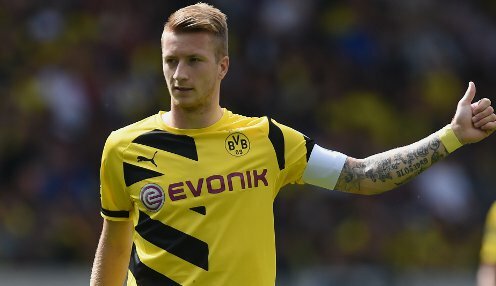 The agency representing Borussia Dortmund forward Marco Reus insist that their client is not looking to move this summer, despite being linked with a number of other clubs. The likes of Juventus, Real Madrid, Arsenal and Manchester United have all been linked with the 26-year-old Germany international, but Sports Total say that Reus will be going nowhere, having signed a contract running until the summer of 2019 a matter of months ago. "We've read the rumours which are circulating about a transfer for Marco," a spokesperson for Sports Total told TuttoJuve. "We can say with certainty that the player is having a wonderful time with Borussia, he's flattered by interest from so many European teams, but recently decided to stay in Dortmund. "We don't plan to grant any more interviews, because there won't be any news." BVB recovered in the second half of last season to finish in seventh place in the Bundesliga and are 1/1 to be crowned champions in 2015/16, with Bayern Munich 1/1 and Wolfsburg 1/1. Meanwhile, Wolfsburg have again reiterated their intention to try and keep Belgium international playmaker Kevin De Bruyne at the club, despite strong interest from the English Premier League. Sporting director Klaus Allofs stated: "Kevin is under contract until 2019, we're not a selling club and we don't need the money. "We're in a project at Wolfsburg to compete one day with Bayern Munich and we are in need of these types of players." However, the Wolves are set to lose midfielder Ivan Perisic, with the Croatian's agent suggesting that a move to Inter Milan could be finalised within the next few days.